1. Azhagi (classic) and Azhagi+ (AzhagiPlus) are 2 different products, as such, considering the program interface and features provided. 2. The instructions given below are for Azhagi (classic) and NOT for Azhagi+ (AzhagiPlus). 3. Hence, if you are looking for operational instructions for Azhagi+ (AzhagiPlus), kindly please click here and do not read any further. How to type using Azhagi? It is just one step only. How to install and use Azhagi after downloading it? Please click here to read detailed instructions. Click on the downloaded Setup file (usually named 'Azhagi-Setup.exe'), to start installing 'Azhagi'. Right-click on Azhagi's downloaded Setup file (usually named 'Azhagi-Setup.exe') and click 'Run as Administrator', to start installing 'Azhagi'. (Note: In case you downloaded 'Azhagi-Setup.zip', open it and extract the 'Azhagi-Setup.exe' inside it to a folder of your choice. Right-click on this 'Azhagi-Setup.exe' and click 'Run as Administrator', to start installing 'Azhagi'). It is advisable and highly recommended to install Azhagi in a directory other than the default 'C:\Program Files\Azhagi'. For e.g. you can install Azhagi in 'C:\MyFavoriteApplications\Azhagi'. When you start Azhagi, usually two windows will get opened. One displaying the Non-Unicode editor and the other displaying the Unicode editor. In the window displaying the Non-Unicode editor, click anywhere on the banner (with two hands pointing at either end) which appears at the top of the window. This will open a document in full screen. In this opening document, you can find various questions (as given here) answered. PLEASE read them. How to directly type in Tamil in MS-Word? Using Azhagi, you can type in Tamil in MS-Word in two different font encodings - "Unicode" and "Tscii"(Non-Unicode). 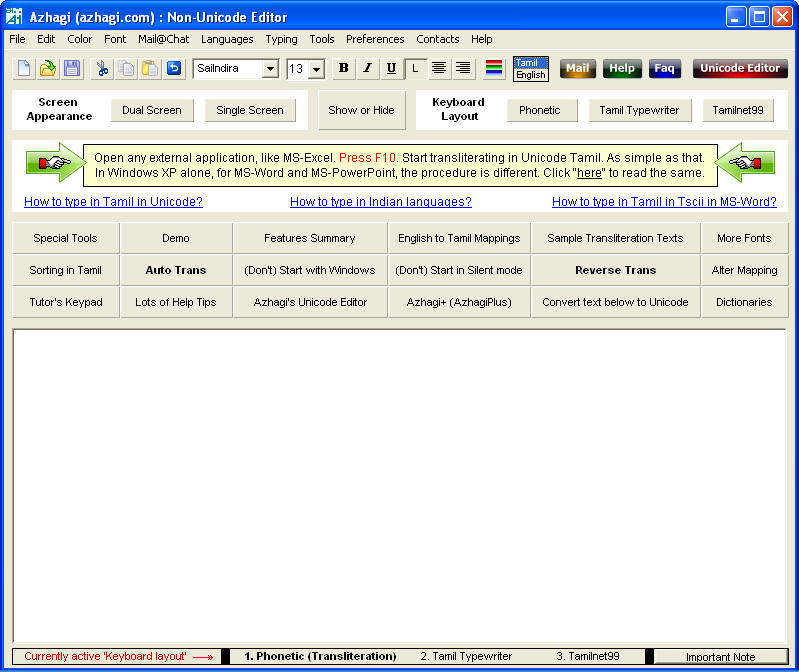 How to type in Unicode Tamil has been explained step-by-step in this page. It is just one step only, as such. How to type in Tscii (non-unicode) has been explained step-by-step in this page. How to directly type in Tamil in ANY application? Kindly please click here. It is just one step only, as such. How to effect Indic (Hindi, Kannada, etc.) input in MS-Word? I suggest you use Azhagi+ (AzhagiPlus) instead of Azhagi, to type in Hindi (Telugu, Kannada, etc. ) in MS-Word. Because, it is just a one-step process. The instruction for the same is here - oper-plus.html#dtany. However, if you are particular (not advisable) that you wish to type using Azhagi only, then please click here. If you wish to download Azhagi+, please CLICK HERE to reach the "Azhagi+ download link" section - available in the home page of azhagi.com itself. How to effect Indic (Telugu, Malayalam, etc.) input in ANY application? I suggest you use Azhagi+ (AzhagiPlus) instead of Azhagi, to type in Hindi (Tamil, Bengali, Gujarati, etc. ) in ANY application. Because, it is just a one-step process. The instruction for the same is here - oper-plus.html#dtany. However, if you are particular (not advisable) that you wish to type using Azhagi only, then click here. By default, 'Azhagi' starts typing in 'Phonetic (Transliteration)' mode only. So, if you wish to type in 'TamilNet99' or 'Tamil Typewriter' mode, select your desired typing mode first. To do the same, click on 'Preferences->Change Keyboard Layout' menu item in Azhagi's opening screen and choose your preferred layout. Alternately, you can also right click on Azhagi's system tray operating icon (which icon you can see at the right bottom of your computer screen, usually near the date/time indicator), move your mouse to 'Typing Mode' and select the preferred layout. For e.g., if you wish to type in 'Tamil Typewriter' mode, then select 'Tamil Typewriter - Traditional' menu item. Once that is done, close* the menu. (*) If the menu does not close automatically after selecting your desired typing mode, click the 'Sink/Close Menu' menu item to close it. You can type/transliterate from within Azhagi also - in either 'Tscii' or in 'Unicode'. You can transliterate in Tscii in either 'Dual Screen' or 'Single Screen'. And, you can convert the Tamil text generated by you to Unicode instantly, by clicking the 'Convert text below to Unicode' button. You can transliterate in UNICODE (in all major Indian languages) in a separate Unicode Editor, which you can invoke by pressing 'F8' or clicking the 'Unicode Editor' button (as you see in the screenshot below) at the top right of Azhagi's opening screen. Phonetic (type as you speak) keyboard layout is the default for the non-unicode editor. You can change it to 'TamilTypewriting' or 'Tamilnet99' keyboard layout, whenever you wish to. Please visit ards.html for comprehensive details on the following power-tools. If you have closed Azhagi and wish to restart it, then click on Azhagi's shortcut icon in the Desktop [See screenshot below to know how the icon will look like. Note that Azhagi's shortcut icon will be available in StartMenu and Quicklaunch bar also. You can avail them too. By mistake, do not click on Azhagi's Installation/Setup File again. This will only start reinstalling Azhagi]. Azhagi application will get started and Azhagi's operating icon (a minimised image of the snapshot you see above) will appear in the right bottom of your desktop/computer screen, most often next to the date/time indicator. You can left-click (just a single click; not double-click) on that icon to show/hide Azhagi's main editing screen. You can right-click on that icon to see a menu of options/info pop up. See screenshot below for better understanding. In the 2 main opening screens (editors) of Azhagi, click on 'Preferences' menu (if it is Azhagi's non-unicode editor) and 'Tools->Options' menu item (if it is Azhagi's Unicode editor) resp. You have quite a few options to set/change under different titles and categories. What each option means is explained in the help topics, which you can access from the 'Help' menu. Please see easytam.html for features in Tamil, feats.html for features in English. A comprehensive FAQ on how to create Unicode websites in Tamil can be read here. Similar instructions are to be followed for creating websites in Hindi, Sanskrit, Telugu, Malayalam, etc. Click here to get more free Tamil fonts - in Tscii, Unicode, TAB, TAM and various other font encodings. Click here to get more free Indian language Unicode fonts.